Its D-Day for MOM! The Mars Orbiter Mission (MOM) is India’s history making first mission to the Red Planet and she arrives today, Sept. 23/24 ! MOM’s goal is to study Mars’ surface features, morphology, mineralogy, and the Martian atmosphere with five indigenous scientific instruments. Among other goals it will sniff for methane. Depending on your time zone, today’s historic arrival falls on either Sept. 23 (EST) or Sept. 24 (IST). MOM’s entire future depends on conducting a successful and precise, do-or-die Mars Orbital Insertion (MOI) braking burn just hours from now. The MOI engine firing is targeted for Sept. 23 at 9:47:32 p.m. EDT and Sept. 24 at 07:17:32 hrs IST. And you can watch all the action live as it happens via a live webcast from the Indian Space Research Organization (ISRO) website, India’s space agency which designed and developed MOM for about $69 Million. The MOI burn involves firing the probes 440 Newton Liquid Apogee Motor (LAM) and eight smaller 22 Newton liquid fueled engines for a duration of about 24 minutes to enter Mars’ orbit. On Monday, Sept 22, engineers at the Bangalore mission control center verified the performance and readiness of the LAM by conducting the final Trajectory Correction Maneuver (TCM-4) with a engine burst duration of 3.968 seconds. “We had a perfect burn for four seconds as programmed. MOM will now go-ahead with the nominal plan for Mars Orbital Insertion,” said ISRO. The Indian engineering team has only one chance to get it right, and the entire world is pulling for India. 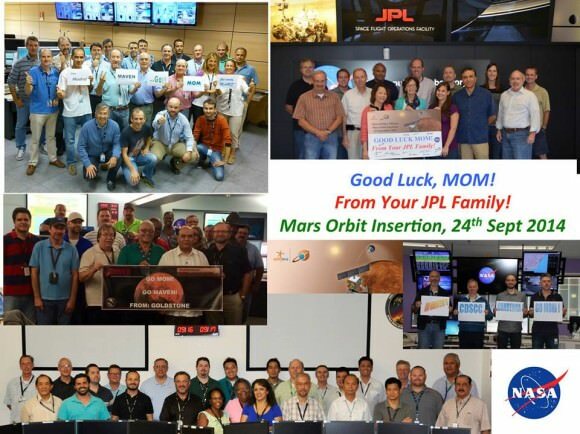 NASA, JPL, and the DSN have sent along extra special good luck wishes in the form of group photos below. Everyone is wishing for complete success for the probe which reaches Mars just two days after NASA’s MAVEN orbiter successfully achieved orbit on Sunday night, Sept. 21. “We wish a successful MOI for MOM,” said Bruce Jakosky, MAVEN principal investigator with the Laboratory for Atmospheric and Space Physics at the University of Colorado, Boulder (CU/LASP) at MAVEN’s post MOI briefing on Monday, Sept. 22. If all goes well, MOM will join Earth’s newly fortified armada of six spacecraft operating on Mars surface or in orbit – MAVEN, Mars Odyssey (MO), Mars Reconnaissance Orbiter (MRO), Mars Express (MEX), Curiosity, and Opportunity. Today, MOM concludes her 10 month interplanetary voyage of some 442 million miles (712 million km) from Earth to the Red Planet.